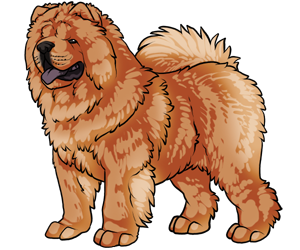 The Chow Chow is possibly one of the very first primitive dogs to develop from the wolf. Although exactly where they originated is unknown, it is believed that the dog developed somewhere around 200 B.C. as the breed is depicted in many Chinese Han Dynasty sculptures and pottery. The Chinese used the dogs as an all purpose hunting, herding, protecting, and pulling worker as well as using their fur for clothing and eating them. The Chow was recognized by the AKC in 1903 and were very popular in the 1920s. Today the breed is less popular due to their bad reputation of being aggressive. The Chow is famous for its blue-black tongue. Sigmund Freud had a Chow named Jo-Fi whom he brought to his therapy sessions because he believed that the dog could judge a person's mental state. Some homeowner's insurance can increase if the person owns a chow because the breed is considered "high risk".